Nationals: Uzbek, Tajik, Russian, Iranian etc. "Everything I have heard about Marakanda is true. Except that it's more beautiful than I ever imagined." Among the cities of the world, one of the most ancient is Samarkand, whose history dates back 2,500 years. In its time, the city was conquered by the warriors of Alexander the Great, the Army of the Arab Caliphate, and the Mongol hordes of Genghis-khan. Each time, after the bloody battles, devastation and fire, it was reborn, to become once again an important city, and at times the capital of a major Central Asian state. Originally Samarkand occupied part of Mount Afrasiab (Afrosiab), which rises to the north of modern Samarkand. The city grew, expanded its borders, and by the ninth century it occupied the entire hill. By the tenth century its numerous suburbs to the south of the hill were built up with bazaars, caravanserais, baths and mosques. This part of the city was well irrigated. In contrast, Afrasiab presented difficulties in water supply, and an intricate arrangement of lead water pipes along an aqueduct was required. When Samarkand was captured by the Mongols the ancient water supply system was destroyed, and life on Afrasiab ended. Today it is a lifeless hill concealing priceless treasures from the artistic culture of the past. The Mongol invasion destroyed the buildings of the previous period. It took a whole century to recover from the after-effects of the Mongol invasion. Plundered and demolished Samarkand was rebuilt on the site of one of its former suburbs. The restoration of the Shakhi-Zindah necropolis, a religious relic, the supposed grave of Kusam ibn-Abbas, was begun on Afrasiab. The building of the necropolis reached its height during the last quarter of the fourteenth century, at a time when the mausoleums for the members of the Timur family, his military leaders and his courtiers, were being built. Some of the structures of the Shakhi-Zindah ensemble date back to the second half of the fifteenth century, the Ulug Beg period. They are: the unreservedly decorated portals (1434 -1435) by the foot of Mount Afrasiab, and the mausoleum higher up the slope, with two elevated turquoise domes, presumably over the grave of the astronomer Kazy-zade-Rumi, Ulug Beg's teacher. The narrow passage beyond the mausoleum is lined on either side with the mausoleums of the Timur period. They form a fantastic spectacle of majolica revetment and tile mosaics. The mausoleum of Shadi-Mulk-aka (1372) and her mother Tour-kan-aka, Timur's sister, are better preserved than others. The facing of the portals is done with blocks of superbly carved glazed terracotta in combination with majolica. The passage between the mausoleums gives way to a charming shady courtyard enclosed by the mausoleum of Tournan-aka (early 15th century), and the mausoleums built before the time of Timur - those of Khoja Akhmad, and of an unknown person. A door with the date 1404-1405, which is decorated with carvings and originally had an ivory inlay, leads from a courtyard to a fifteenth century mosque and the earliest and principal mausoleum, that of Kusam ibn-Abbas. The colored enameled revetment of Shakhi-Zindah is unique. The stone masons who followed one another over a century were able to unite individual buildings into a single architectural ensemble with great artistic gracefulness. Towards the end of the fourteenth century, Samarkand became the capital of the huge Empire of Timur. The Bibi-khanum mosque was built in great haste in the years 1399-1404. The walls of the mosque are faced with polished brick, which serve as a backdrop for the blue enameled bricks used for a large geometrical decorative pattern. Such monumental ornamentation is characteristic of the buildings constructed for Timur. One of the last of Timur's structures in Samarkand was the mausoleum of Gur-Emir (1403-1404), which served as the tomb for his sons, his grandson Ulug Beg, and for himself. The mausoleum was added to the existing complex of two buildings, that of the madrasah and khana-gah, forming as it did the third side of a courtyard. The fourth side was formed by entrance portals decorated with glazed tile mosaics. In the fifteenth century, during the time of Ulug Beg, structures were less grandiose but were distinguished by nobility of form and a great harmony of colored enameled revetment: the entry portals, the mausoleums of Kazy-zade-Rumi, the octagonal Shakhi-Zindah, and the madrasah in Reghistan, the large square in the busiest part of the city (1420). Ulug Beg's observatory outside Samarkand was a unique structure. After Ulug Beg was murdered it was abandoned and by the sixteenth century it was in ruins. Alongside the monumental fifteenth century buildings, smaller architectural ensembles were erected. Such is the ensemble Khoja Abdi-Darun. When Bukhara once again became the capital in the sixteenth century, there was less construction in Samarkand, and many structures suffered neglect. In the seventeenth century the Madrasah Shir-Dor (1619-1636) was built, where once stood now the now nonexistent khana-gah of Ulug Beg. The building stands on the same axis as the Ulug Beg Madrasah and repeats its facade not only in size but also in its overall composition. 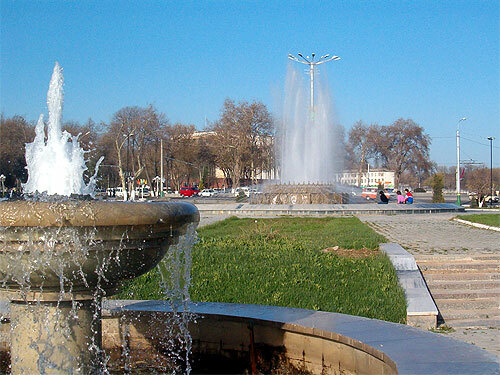 The third side of Reghistan Square was occupied with Tillah-kari Madrasah (1646-1660). As Timur's Bibi-khanum mosque was in ruins by that time, a Friday mosque was added to the complex of structures comprising the Tillah-kari Madrasah. After the seventeenth century, the situation in the country changed. Never did architecture in Samarkand reach such heights again. 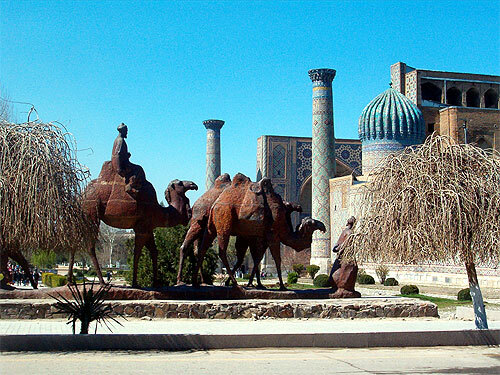 But the ancient city continued to exist, and now it is once more a thriving, developing city, one of the industrial and cultural centers of Uzbekistan. The end of the 4thc., the beginning of the 3rd c. BC invasion of the army of Alexander the Great. 328 BC the uprising against Alexander the Great; the town was destroyed. The 4th-3thc. BC scene of struggle between the Selevkids's state against Parfians. The 2nd-3rdcc. BC - the war between Partia and Greek-Bactrian Kingdom. The 1stc. BC the 1stc. AD flowering of trade and culture; reign of Kushan kings. The 8thc. the town was conquered by Arabs. The 7th-8thcc. Samarkand was the heart of Sogdiana. 720 - 721 Said Khusein conquered the town; conversion of Sogdians to Muslim faith. The 11thc. Samarkand lost the status of leader in culture and economy; prestige of the capital town was taken by Bukhara. The 1Oth-11thcc. continual uprisings against Bukhara rule; Muhammad Khorezm-shah came to power. 1220 regiments of Genghis khan destroyed the city. The 14thc. Tamerlane's troops freed Samarkand from the Mongols; Samarkand became the capital of the Temurids. The 14th-15thcc. the beginning of intense building of the city during the absolute rule of Tamerlane. The 15thc. the throne was handed over to Ulugbek, Tamerlan's grandson. The 15th-16thcc. Sheibaniy-khan's offence; Samarkand was conquered by nomadic Uzbeks. The end of the 16thcc. the beginning of the process of feudal territorial division caused by the economic decadence of Samarkand. 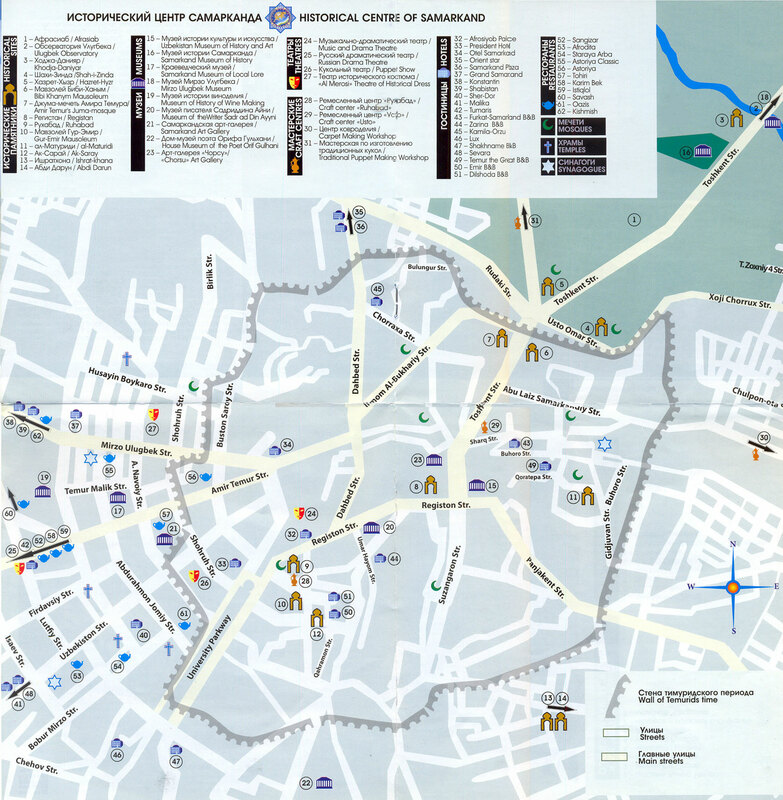 1740 - during Nodir Shah's attack, all the residents were massacred; by the end of the 18thc. Murad-shah gradually had rebuilt the city. 1868 - Russian troops occupied "The Holy City" Samarkand. 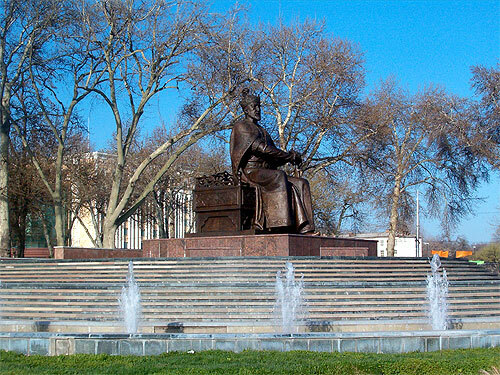 1929 - 1930 Samarkand was the capital of the Uzbek Soviet Republic. Samarkand has always been famous as a cultural center and today is considered to be a city of craftsmen and scientists.